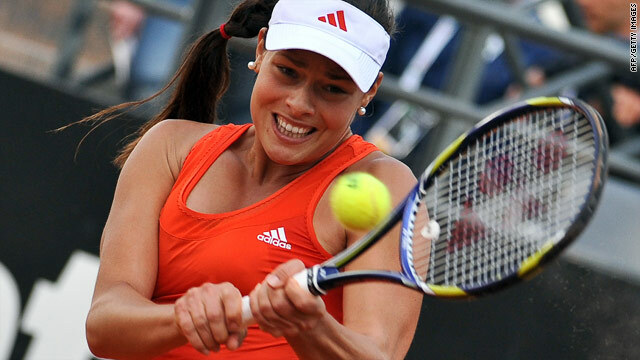 Serbian pinup Ana Ivanovic is seeking to win her first WTA Tour title since October 2008. (CNN) -- Former world No. 1 Ana Ivanovic produced her best form in almost two years to reach the semifinals of the Italian Open on Thursday, but hopes of an all-Williams last-four showdown ended when Venus suffered a humiliating defeat on the red clay. Ivanovic literally had the tennis world at her feet after winning the French Open in 2008, but she has since slumped to 58th in the rankings after a dismal past two seasons. However, the Serbian now has the chance to reach her first WTA Tour final since March 2009 after defeating 14th seed Nadia Petrova 6-2 7-5 to set up a clash with unseeded Spaniard Maria Jose Martinez Sanchez. The 22-year-old Ivanovic had not won back-to-back matches since January, but began her Rome campaign with a win over Russia's Elena Vesnina, then upset ninth seed Victoria Azarenka and registered her first-ever victory against Olympic champion Elena Dementieva on Wednesday. If she can beat Martinez Sanchez, she will face a final against either world No. 1 Serena Williams or the formerly top-ranked Jelena Jankovic. "I think every player in one way or another goes through a tough time, and I think it is not how many times you fall but how many times you get back up," Ivanovic, who this year has been working with Steffi Graf's former coach Heinz Gunthardt, told reporters. "This tournament and these victories that I have had this week mean a lot to me because I have put in so much work, not only in the last months but also the last year and it was just not happening. Now I am just so happy to be back on track." Jankovic, who unlike her compatriot Ivanovic has never won a Grand Slam tournament, is also enjoying a career resurgence. The seventh seed followed up her demolition of No. 11 Yanina Wickmayer by crushing Venus Williams 6-0 6-1 in Thursday's late match, inflicting the fourth seed's worst defeat of her distinguished career. The 25-year-old Jankovic won at Indian Wells in March and then reached the quarterfinals at another U.S. event in Charleston and also in Stuttgart, Germany. Serena Williams, playing her first tournament since winning the year's opening Grand Slam, the Australian Open in late January, had her easiest win of the week as she dispatched Russia's Maria Kirilenko 6-1 6-4. The American, who lost in her first match last year, won 10 of the first 11 games before a series of errors let world No. 37 Kirilenko back into the match. Martinez Sanchez, who knocked out world No. 2 Caroline Wozniacki on Wednesday, progressed into the last four by defeating unseeded Czech Lucie Safarova 7-6 (8-6) 6-4.